Carrying capacity. Delivering cutting edge science to the aquaculture industry. Start Knowing. A cost effective method improve biomass production and water quality. Sustainability. The most advanced carrying capacity techniques in order to address sustainability at the farm scale. Track Record. Published science, largest portfolio of species and tested in Europe, US, Asia and Africa. Farm Management. Innovative approach for optimisation of aquaculture biomass production. Water Quality. Know what impact farm production is having on water quality. Mass Balance. Get the big picture and know the harvestable biomass, feed usage, and water quality changes in one screen. Site Production. Aquaculture modelling in order to assist with site selection and production expansion. The FARM modelling determines the sustainable level of production for farms, improving profitability and environmental stewardship. framework applies a physical and biogeochemical models, bivalve/finfish growth models, and screening models for determining aquaculture production and eutrophication assessment. FARM determines the optimal carrying capacity (the greatest sustainable yield of market-sized animals within a given time period). The FARM model also calculates profit optimisation using marginal analysis and can be used for the valuation of nitrogen credits. Evaluation of potential nitrogen credits. Production Analysis Simulation of biomass production. Changes in stocking density, mortality. Optimum profit structure with respect to stocking density, farm and feed. Calculation of Average and Marginal Physical Product (APP and MPP). Dissolved oxygen & sediment oxygen demand analysis. Effect of the farm on water quality & assessment of farm eutrophication. IMTA simulation on water/sediment quality. Mass Balance Analysis Mass balance analysis for aquaculture farms. Environmental footprint of aquaculture farms. Production analysis, algal growth calculation, dissolved nutrient analysis. Disease Analysis Stressor-related models to assess disease outbreaks probability. Farm width, length and depth. Number of structures (cages, longline, trays). Economics and Finance Seed cost per thousand. Sale price per kg & feed cost per kg. Seed and harvest weight (Total Fresh Weight). Drivers Water temperture (ºC), salinity, chlorophyll a, Particulate Organic Matter, Total Particulate Matter, dissolved oxygen (DO). Culture Practice Farm data and stock density. Feed applied (% of Total Fresh Weight). If you would like to know more about any of our aquaculture models or have any questions talk to us. FARM paper published in the Aquaculture Journal. 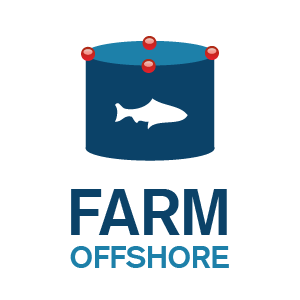 FARM helps offshore and nearshore aquaculture farms produce sustainably, determining harvestable biomass and carrying capacity. 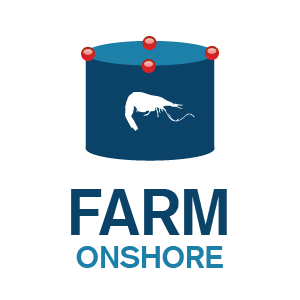 FARM provides a production analysis, a water quality analysis and a mass balance analysis. FARM es un modelo acuicola que permite un enfoque de costo efectivo para optimizar la producción, el análisis de la calidad del agua y la optimización económica de granjas acuicolas costeros y en mar. FARM ajuda explorações aquícolas no mar a produzirem de forma sustentável, optimizando a produção aquícola, a qualidade da água e os efeitos ambientais no local de cultivo e a componente económica da produção.